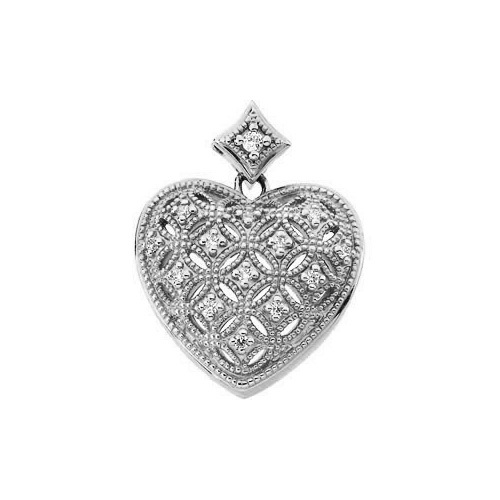 This pinpoint-set diamond heart pendant in 14K white gold from Apples of Gold Jewelry is the perfect addition to a favorite chain or a chain purchased specifically for this beauty! Sized at just under 1 inch tall by 3/4 of an inch wide, this diamond heart pendant glitters with the combination of white gold and diamonds. She will feel like royalty when she wears this pendant, which is patterned with overlapping circles and a diamond shape on top (which also contains a diamond!). The diamonds are rated G-H for color and I1 for clarity, and total 0.125 carats (1/8 carat). We guarantee our Pinpoint-Set Diamond Heart Pendant, 14K White Gold to be high quality, authentic jewelry, as described above.